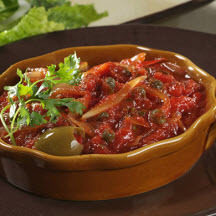 Traditionally served with fried fish, this classic Puerto Rican tomato sauce is delicious served alongside a variety of seafood dishes, including Crab Meat Piononos. Keep olives, capers, and pimentos on hand in your pantry so you can prepare this easy sauce often. Combine all ingredients in medium saucepan. Cook over low heat, stirring occasionally, until onions are tender. Remove bay leaf. Season to taste with pepper. Serve with fish or shellfish. Store tightly covered in the refrigerator. Makes 12 servings (1 1/2 cups). Nutritional Information Per Serving (1/12 of recipe): Calories: 40 Calories from Fat: 25 Total Fat: 2.5 g Saturated Fat: 0 g Cholesterol: 0 mg Sodium: 150 mg Carbohydrates: 5 g Dietary Fiber: 1 g Sugars: 2 g Protein: 1 g.